The JKCET answer keys are available online from 29 May 2017 at link below. The candidates can download them from here via J & K BOPEE official Websites (www.jakbopee.net or www.jakbopee.org or www.jkbopee.in). All the sets / series question's answer are going to be available in those keys. You can find your estimated score through them. Final Answer key will be released after receiving objections. Jammu and Kashmir Board of Professional Entrance Examination (JAKBOPEE) had conducted CET for admission to Medical & Engg. UG Course. JK Common Entrance Test (CET) Engineering was held on 28 May 2017. Earlier JK BOPEE had invited applications for this entrance test. Now the answer key of JKCET are available now. Those candidates who had appeared for the examination, can download JK CET Exam answer key from here. The CET for all the eligible candidates (PCM) was held on 28 May 2017. It is to be organized at the designated Test Centres of Jammu and Srinagar with only one meeting on Sunday. (i) JK CET answer key will be displayed on the BOPEE’S website in the evening on conclusion of last meeting of the test. They will remain on the site for three days and then got removed. (ii) The Paper (Physics and Chemistry) have 120 questions to be attempted in 120 minutes. JK CET Physics & Chemistry Answer key will be available here. (iii) The Paper (Mathematics) have 60 questions each of 60 minutes duration. JK CET Mathematics Answer keys are going to be available for download here. After the release of answer key, representations will be invited from candidates. 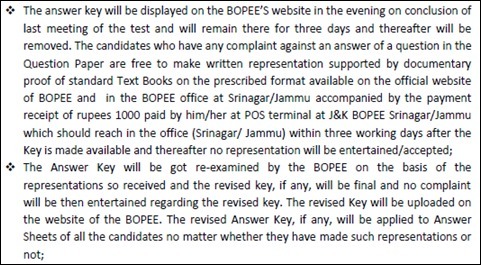 After that, the Answer Key will be got re-examined by the BOPEE on the basis of the representations so received and thereafter JKCET revised key will be released. JKCET questions shall be multiple choice objective type withone mark each. shall consist of one singal paper of PCM. There are 180 questions that are asked and are to be answered in 3 hours duration. There will be 0.25 negative marks for each wrong answer. 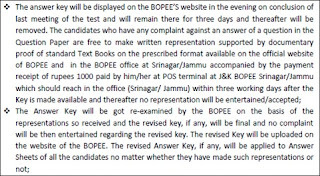 The candidates can download their JK CET answer key from JAKBOPEE website from here. The official answer key can be matched with answers given by candidates to find their estimated marks. To download the answer key for JKCET exam, candidates need to visit below link. We will provide you the direct links to download the keys through which you can check your marks. The JKCET answer key 2017 will be available here after the exam on 28 May 2017. Download JKCET Answer key from below links.